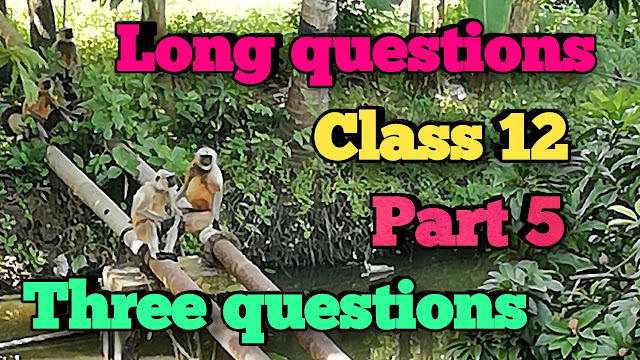 Today I will discuss about the long question and answers suggested questions from three questions by leo tolstoy . Hope you can learn more about from this article. Here he refers to the certain Tsar, who wanted to know the answer to the three questions. The Tsar had declared a prize for the man who could give him the answers to the three questions that had come to his mind. Many learned men came to the Tsar and gave answers to his questions. But as the answers were all different, the Tsar did not accept the answers. As he still wanted to know the right answers, he decided to consult the wise hermit. The Tsar knew that the hermit received none but the common man. So he put on Simple clothes and went to meet the hermit on foot leaving behind his horse and Bodyguard. The Tsar said this to the hermit who was digging the ground in front of his hut in the wood. The hermit was a thin and weak man. Whenever he struck the ground with the spade and turned a little Earth, he breathed heavily out of exhaustion. The Tsar saw that the hermit was feeling out of breath at every stroke he made . The Tsar felt pity for this weak person and offered to dig for him. The hermit accepted the offer and sat down, giving the spade to the Tsar. He dug the beds continuously till the sun went down behind the trees in the wood. 3)how did the Tsar nurse the wounded man? When the bearded man came running and fainted the Tsar unfastened his clothes with the help of the hermit. He saw a large wound in the stomach. The Tsar carefully washed the wound and bandaged with his handkerchief and the hermit's towel. But the blood was still flowing and he washed and rebandaged the wound. When the man came to his senses the Tsar brought fresh water for him to drink. At nightfall, he carried the man inside the hermit's Cottage and laid him on the bed to rest.